This session was the launch for "Duncan's Journey - One Fan's Perspective", a video shot by Carmel Macpherson and Sonja van den Ende in Scotland and Paris after their attendance at the Chronicles '99 convention. Carmel admitted that, after they had the initial idea, Sonja kept asking her if she had done the script, which Carmel reassured her that she had. The penny dropped with Sonja when they shot the very first take, when after Carmel had been talking for 20 minutes, Sonja asked her if she was ever going to shut up! Carmel said that she had always had faith that Sonja would edit down her rambling into something coherent. After Carmel showed the first part of the video, (which includes actual Highlander footage, courtesy of Bill Panzer), she was joined by Elizabeth for a discussion with the audience on Duncan as the predator. 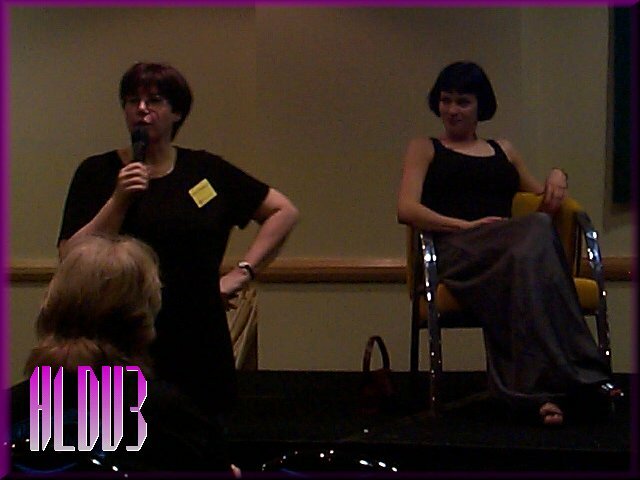 In something of a volte face from the "Methos - What Game Is He Playing" session with Peter Wingfield at HLDU2, Elizabeth took on the persona of Amanda for the discussion that followed, although by the end, she was commenting as herself as well as Amanda. Lizzie said that, for Amanda, Duncan was the ultimate lover, but he was also her ultimate friend, a big brother who always played by the rules, whereas Nick Wolfe came along when Amanda was in the middle of finding her conscience. In that way, Duncan MacLeod of the Clan MacLeod was a hard act to follow, almost a curse on Amanda as a lead and consequently heroic character. Throughout Highlander, Amanda always had Duncan to turn to, whereas at the beginning of The Raven, she had no around to turn to and had to find herself. Nick Wolfe was very different. She felt that Duncan's attitude to Amanda is that, even when she is bad, she has a good heart, whereas the bad guys in Highlander are BAD. Of Methos and Duncan, the discussion turned to how Duncan took on the guilt of being a murderer in "Forgive Us Our Trespasses". Elizabeth said that, by nature, all Immortals are warriors, but Duncan feels obliged to pass judgement. Methos doesn't carry that burden of judging right and wrong, but he does have a wisdom that comes from his age. For her, Duncan is the heart of Highlander, but Methos is the mind. Asked what keeps bringing Duncan back to Amanda, she laughed and asked wasn't it obvious? (The dancing, of course!) She said that the Immortals don't naturally trust many people, so they would gather together with those that they do trust. She felt that Amanda provides a lightness in Duncan's life. Asked how Amanda would cope if someone took Duncan's head, she said that it would break Amanda's heart and spirit. She would try to carry on with the memory of Duncan inside her. She said that she felt that this was why Amanda had been basically unhappy during The Raven episodes, in that Duncan wasn't around. There were many times when she had annoyed Duncan, but he had never rejected her. Although some of the things she did angered him, she knew where the line was and would never cross him in that way. She said that they had shot two endings to "The Colonel", the one shown, which she felt was stronger, and one in which her protégé dies. This would have freaked out Amanda and was felt to be too heavy all round. Returning to what would happen if someone killed Duncan, she spoke of the way in which friends had gathered round when Duncan was in danger. She said that Amanda had evolved during The Raven and, if someone did take MacLeod's head, his friends would seek vengeance. 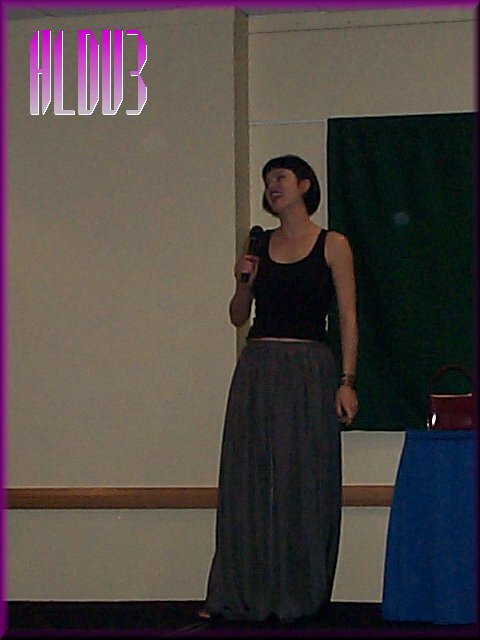 She said that, as far as she knew, Methos and Amanda first met on the barge during "Finalé", a view which differs from Donna Lettow's as expressed at Chronicles '99. (I intended to ask her about this during the "Methuselah's Gift" session, but the scene I had in mind, - "it's devious, it's just like him" - came without sound when Maureen Russell got the dailies, so she didn't show any of it.) Asked if Duncan and Amanda would ever spar and, if they did, whether they would hold back, Elizabeth grinned wickedly and said "darling, I've seen all his moves". Asked why Duncan was harder on bad Immortals than bad mortals, Elizabeth though for a moment, then said that Immortals had been given a great gift, but if they abused it, then Duncan would show them no sympathy.